Starting with a generous donation by the Kozak family, and through the hard work of a few dedicated parishioners, St George Serbian Orthodox Church opened a parish bookstore in 2016. 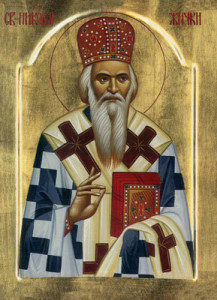 Dedicated to St Nikolai of Zica, a Serbian Orthodox Saint whose ministry was important to the faithful Christians in America, our hope is that this will be a resource for parishioners and guests looking for literature, education, crosses and gifts. The St Nikolai Bookstore is open on Sundays from 11:30am – 1pm, and by appointment. We accept Mastercard/Visa, as well as cash! Vigil lamps, incense, incense burners, etc.